What is Aboriginal rock art? Rock art consists of images made on rock. The images can be painted, engraved, sculpted – even made with beeswax and spinifex resin. Rock art dates to at least 40,000 years ago. Australia has some of the world’s earliest rock art. It has continued to be made by people all over the world for a huge variety of reasons. It is still created right up until today in some places – Australia again being one of these places. Where is the rock art? Rock art is found throughout the world. Australia has numerous rock art rich regions. These include the central desert, Cape York and Arnhem Land, the Burrup Peninsula (with over 1 million engravings) and the Kimberley. Even near large urban centres like Sydney, there are significant bodies of rock art. Western Australia’s Kimberley is a major rock art landscape. It’s in an area approximately 423,500 square kilometres, roughly the size of the United Kingdom. Much of the art is in remote areas which are very difficult to get to. Other sites are more accessible but can only be visited with the correct Indigenous permissions and protocols in place. Who made the Kimberley rock art? Kimberley rock art was made by indigenous Australians on their traditional land. Many different groups created many different styles of rock art. 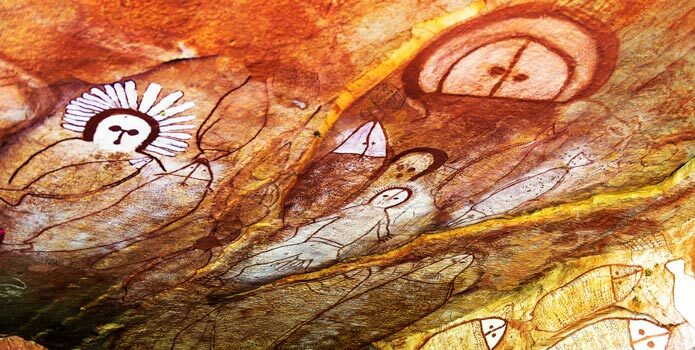 The art has been made by the people of the Kimberley region for thousands of years. Some art is still being refreshed, and new art is being created. How was the Kimberley rock art made? People also arranged stones in the landscape to make symbolic ‘stone arrangements’. People even scraped burnt earth to make images. Kimberley rock art is mostly painted with different kinds of ochre that bond incredibly well with the sandstone, lasting hundreds, thousands and even tens of thousands of years. Human vandalism is limited because of the remoteness of most sites. Indigenous Rangers work hard on ‘Healthy Country’ plans in collaboration with archaeologists to ensure rock art sites are well managed. How many rock art sites are there? No one knows exactly how many sites there are. Several thousand sites have already been recorded, but it is estimated that there are tens of thousands more, mostly in rock shelters but also on flat rock expanses, on large boulders – anywhere there is a substantial body of rock. How old is the rock art? The oldest dated rock art consists of an ochre-smeared chunk of limestone from Carpenter’s Gap in the south-west Kimberley that was found in archaeological layers dated to 41,000 years ago. Other dates suggest images were made since that time right into the present. What does Kimberley rock art mean to traditional owners? 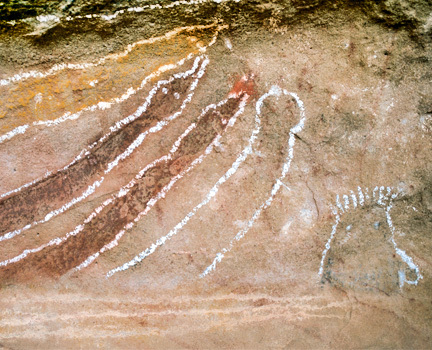 The sites of the rock art are very important to traditional owners in the Kimberley because they are records made by their direct ancestors. Many of the sites are considered sacred because of the ceremonies that have been carried out in those places. How traditional owners interact with the rock art varies from site to site and community to community. It is sometimes difficult for traditional owners to get to the sites of rock art that are in very remote regions. People around the world are excited by the art – why? The art is exciting because it demonstrates that the local Indigenous people belong to the oldest living culture on the planet. The age and detail of the art mean that there’s a lot that can be learnt from it. The art can tell the history of the land and how the culture changed over time. What are the different types of art people have found? What do they look like? There are more kinds of rock art than we know of and future research will help us understand the full range of Kimberley rock art. 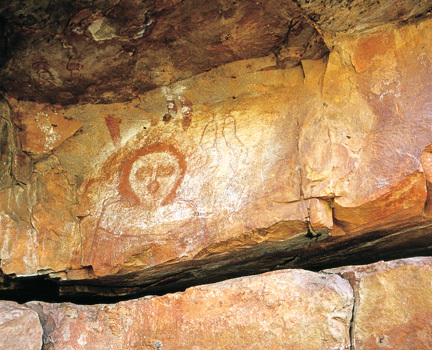 Following are some of the more recognisable types of Kimberley rock art. These are images and motifs carved, engraved, pecked, incised, scraped and even rubbed into rock. These can also include arrangements of rock into symbolically significant patterns. This is a type of rock art shows depictions of animals with very few humans shown. There are also many depictions of plants in this style. Also known as ‘Kwion’ and previously as ‘Bradshaws’. The latter is a Westernised name which is no longer in use. This style is characterised by many human figures with accessories such as bags, tassels, headdresses and objects. This style includes images of humans drawn in a more static, less flowing form. These human figures often have multiple coloured clothing/body adornment. They might carry barbed spears and dilly bags. These are paintings of people drawn in a clothes peg shape with decorative costumes. Painted hand is another Western term for a style that includes isolated human hands – often painted with decoration. These are often associated with human and animal figures. What else have we learnt from studying Kimberley rock art? 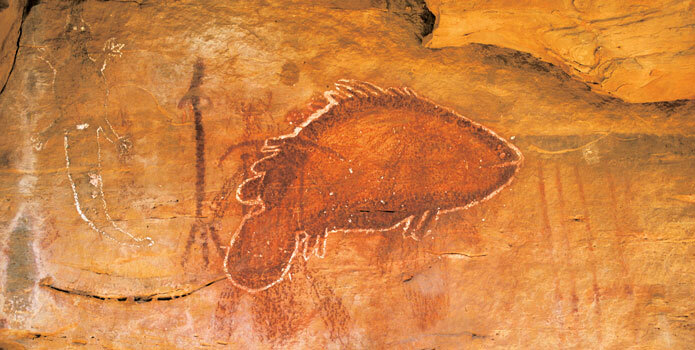 The rock art is a historical record of how the culture of the local people evolved. It can tell us about changes in geography and climate, changes in animal and plant life. It is also a record of how people lived and what was important to them. It is a record of complex thoughts, symbolism, belief and the thoughts that most deeply moved people.